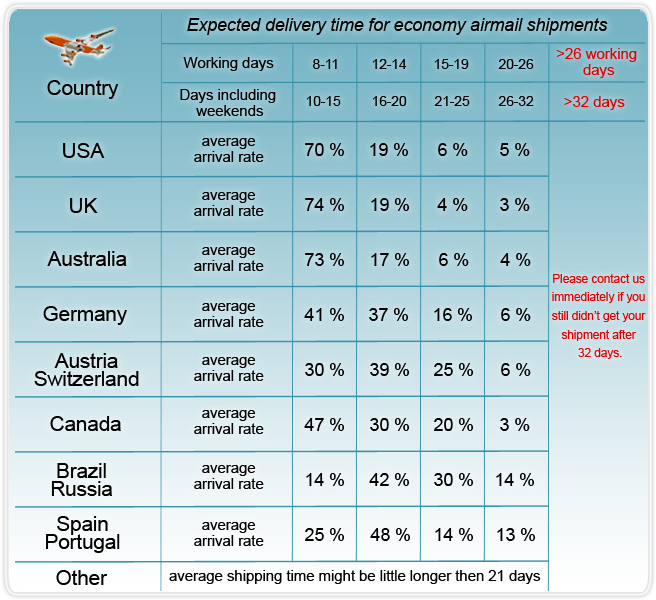 Our airfreight shipping charges or when indicated free shipping charges are valid for all countries worldwide. We would like to point out, that our shipping charges are based on the total weight of your shopping cart. We also would like to point out, that we can not ship to (DHL)Packing-stations or Lockboxes. Your shipping charge is calculated by the total weight of your shipment. Every Shopping cart is including a basic airfreight charge of 1.50 USD. 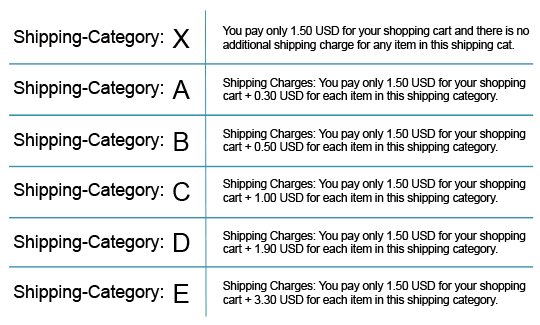 Every item in our shop is (based on its own weight) assigned to one of the following shipping categories. 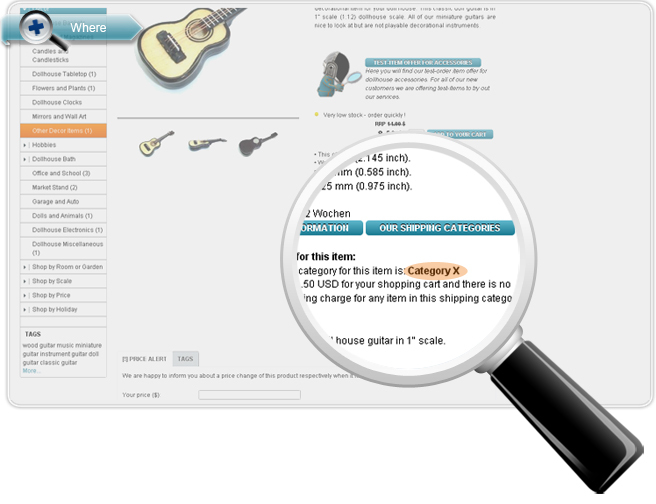 The relevant Information that which item belongs to which shipping-category you will find in the item description itself, right next to the item pictures under the sub-heading shipping charges. Packages whose declared value is under $200 ($100 if being sent as a gift to someone other than the purchaser) will generally be cleared without any additional paperwork prepared by CBP(Customs and Border Protection). However, CBP always reserves the right to require a formal entry for any importation and generally exercises this option if there is something unusual about the importation, or if important documents such as an invoice or bill of sale do not accompany the item. To speed a package through CBP examination at a port's International Mail Branch, the seller should affix a completed CN 22 or CN 23 to the outside of the package. This form may be obtained at local post offices worldwide. All packages, sent by 321bay, are on the outside affixed with the completed CN 22 forms. Our customers in the USA and Canada never had any kind of complications during their imports from us and are frequently receiving our shipments from Hong Kong without interventions of the CBP. For further infromation please visit the website of the USA Customs and Border Protection here. Under the provisions of the Postal Imports Remission Order, if someone mails you an item worth CAN$20 or less, you don’t have to pay duty or taxes on the item. All packages, sent by 321bay, are on the outside affixed with the completed CN 22 forms and showing the total value of the package. Our customers in the USA and Canada never had any kind of complications during their imports from us and are frequently receiving our shipments from Hong Kong without interventions of the CBSA. For further infromation please visit the website of Canada Border Services Agency here. Generally, there is no requirement to pay duty and Goods and Services Tax (GST) on imported goods valued at or below A$1000, except for alcohol and/or tobacco products. All packages, sent by 321bay, are on the outside affixed with the completed CN 22 forms and showing the total value of the package. Our customers in the Australia never had any kind of complications during their imports from us and are frequently receiving our shipments from Hong Kong without interventions of the Australian Customs and Border Protection Service. For further infromation please visit the website of Australian Customs and Border Protection Service here. All packages, sent by 321bay, are on the outside affixed with the completed CN 22 forms and showing the total value of the package. Our customers in the UK never had any kind of complications during their imports from us and are frequently receiving our shipments from Hong Kong without interventions of the UK Customs Agency. For further infromation please visit the website of GOV.UK here. We aim to despatch orders the same day by our economy international airmail post or if required express delivery agent (transportation surcharges may apply for express deliveries). We aim to keep stock of all items, but should anything be temporarily unavailable or delayed for reasons beyond our control we will keep you informed. If by any reason we are unable to supply the product ordered we will inform you and, if you have already paid, refund you in full amount. All items will be shipped by economy airmail from Hong Kong and should arrive at your destination within 3-2 weeks. The Express delivery takes usually 3-4 working days and is the perfect solution for all last minute gift shoppings. If you decide to choose the Express delivery please let us know in advance and we will inform you about the additional shipping charges to your destination.